Has this weekend gone. It's seems as if my weekends just fly by in a mili second. 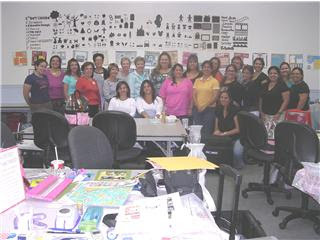 Saturday was National Scrapbook Day... Damaris, Vanessa and I had a great time at our LSS. 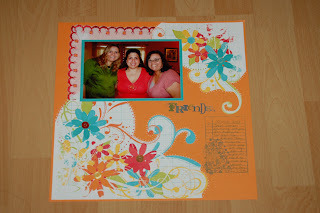 I finished one day of my Ali Edwards project which is approximately five layouts and I did an additional five layouts. Not bad, Not bad at all. Here's a picture that the owner took of all of us. You can find us at the far right hand corner. It's not a great picture but it's definitely going into my scrapbook. Today was a wonderful day. I went to see my grandmother and my mother. My mother made a home cooked meal which is wonderful because she's not one to cook so it was special for us. Than we went to the movies to watch Made of Honor which I really liked. It had some really funny scenes. All in all it was a wonderful day. I'll leave you with a recent layout I made using ScarletLime's April kit. I did some other delish layouts so I'll post them soon. I hope you have a wonderful week and happy scrappin. oohh you went to STUFF! I almost passed by. We were at The Falls. Glad you had a great time!!! We need to get together one day here for a crop. Love love love that orange layout! Colors and designs are very me! What a cute layout you made with a photo of us. Very special indeed! Love ya! Looks like fun! I still need to post about my NSD crop!